In addition to educational opportunities, the symposium will provide camaraderie and a great chance to explore the natural beauty of northern Florida. On Tuesday evening, participants will have the opportunity to visit the coastal town of Cedar Key – a quiet island community nestled among many tiny keys on the Gulf Coast of Florida. Long admired for its natural beauty and abundant supply of seafood, it is a tranquil village, rich with the almost forgotten history of old Florida. Upon arrival, attendees will have some time to explore the many shops and sights of the Key, including antique shops, art galleries, and food stores. The business district is centered around Dock Street and Second Street, but there are plenty of shops along State Route 24 and on the side streets of Cedar Key. After sightseeing, attendees will head to The Island Room restaurant for a delicious dinner featuring traditional Florida cuisine, as well as a short presentation on the Florida clamming industry. 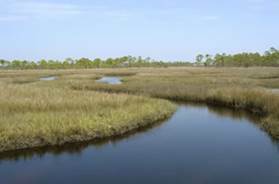 Finally, this evening tour will take participants to the Cedar Key salt marsh, where they can observe the habitat and behavior of the Florida Intertidal Firefly Micronaspis floridana, a monotypic species found only in association with salt marsh habitats. Casual field attire such as lightweight long sleeves and long pants and closed shoes, bug repellent, and binoculars. There is a wooden boardwalk over the salt marsh that will be accessed for firefly viewing. Keep in mind that the weather will be humid, and comfortable clothes suitable for warm weather are suggested. Dinner at The Island Room restaurant. Menu to feature traditional Florida cuisine including Cedar Key clam chowder, a seafood boil, and baked fresh fish. Cedar Key is located approximately 60 miles southwest of Gainesville on the Gulf Coast of Florida. Included with completed and paid symposium registration. Guests may attend the evening tour in Cedar Key for an additional $60.00 fee per guest.